Monday (Feb. 27): What Pet Should I Get? Reading a Good Book is always a treat! Today is the deadline for the Seussical Art Competition! Tuesday (Feb. 28): Oh, the Places You’ll Go! Read to Succeed! “Team up” with reading by wearing your favorite school/college jersey! Let’s see how many different colleges we can see! 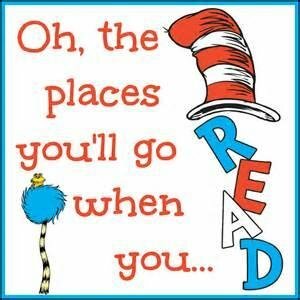 Oh, the places you’ll go … if you read! Wednesday (March 1): The Foot Book! - March into a Great Book! “March” into the Library and donate a great book! If you have a book, please bring it to the library after announcements on Wednesday! We would love to have gently used hardback books! Thursday (March 2): Cat in the Hat - Hat’s off to Reading! We would like to honor Dr. Seuss’s birthday (March 2) by wearing “hats” (free of charge)! The Book Club is also hosting a Read-a-thon in the foyer throughout the day! Be sure to go and check them out! The Seussical Art will also be on display in the foyer! Friday (March 3): One fish, Two Fish, Red Fish, Blue Fish – Fishing for a Good Book? We will have a “bowl of fish” (goldfish) in the foyer. Please take a guess on how many fish are in the bowl! A form will be available for you to sign! A prize will be awarded! Fishing for a good book? … stop by the library!